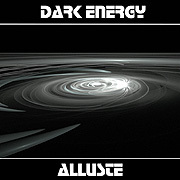 An intricate combination of the discovered and the invented, Dark Energy (86'50") is an effortlessly excellent example of Spacemusic. Realized by Piero Monachello, under the name Alluste, it feeds us a fresh dispatch from this ever expanding strand of Electronic Music. What elevates Dark Energy above an average cosmic drift is the obvious joy with which Monachello imbues his work. Profound wonderings, among the stars, synthesizers and the listener's psyche, produces music that is experienced equally by way of the senses and the psychological. Neatly built throbbing sequencer exercises provide a hurtling onrushing quality. As electronic harmonies rise and fall, in light and dark tones, an unexpected beauty emerges. This music may portray the enigmatic cool of the deep space traveler, but all the while it never ceases to generate heat. Warped out echoing chords break down in pulsing arpeggio blips as suspended strings detail a build up of charge. Slow melodies hold forth above a venting sonic mass, while chiming patterns cycle and peal out alongside animated keyboard leads. Dark Energy, rich with detail, rewards close and prolonged regard. It asks for a mode of attention that is closer to that of listening to poetry, than the common cursory scanning fostered by the clicking and swiping of smart phones and social media. Spacemusic consistently inspires new, deeper thinking. It urges us to be more, not to just want more.